Despite missing several key players, there is hope for India in the World Cup that is being held in Bhubaneswar. Beyond Australia and Holland, the title of world hockey now has multiple contenders in the run. Below is an old dogs’ lookout on the 2018 Men’s Hockey World Cup, India. Hockey has come home, to the nation which crowns it as its "national game". The state-of-the-art blue astroturf Kalinga stadium in Bhubaneswar looks inspiring. All the participant federations have not just appreciated the aesthetics of the stadium, but are also patrons to the facilities being offered by the hosts. One can just feel the vibrating atmosphere of the larger-than-life arena even when it’s empty. It’s not so hard to imagine how magically alive it will be when it’s packed and local stars Biren Lakra and Amit Rohidas will run forward and take a drag flick with the desi hockey flair. This World Cup is a fine cross of progressive synergy between sport administration and political leadership. The Odisha government and Hockey India have come together over the last four years to consciously develop a strong base of field hockey involving infrastructure, fan base and pipeline of budding players in Odisha. Multiple FIH tournaments have been successfully organised under the partnership and winning the bid to host the world cup comes across as a well-deserved opportunity. 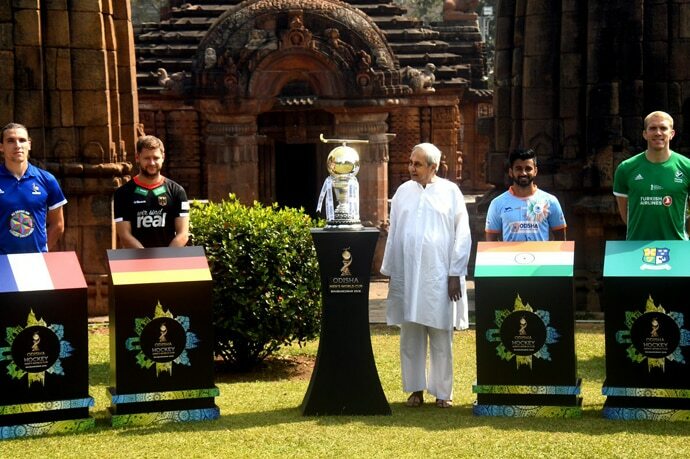 On Monday, Chief Minister Naveen Patnaik posed with the trophy and all 16 captains at the Mukteshwar Temple, while the states' sports minister, Chandra Sarathi, participated in a hawan organised in the stands of the stadia for the prosperity and well-being of field hockey. Talking about matters on the pitch, when the playing quarters commence, the defending champions Australia will be keen to prove their supremacy while the Dutch, on the other hand, would want to wipe clean the memories of 2014 finals (6-1) defeat. Argentina having resolved their internal issues with a new coach (Orozco) will look to take charge as they walk into this tournament with the credentials of being Olympic Champions. Belgium arguably have the strongest playing group – involving Pakistan, Malaysia and Germany – but the Rio Olympic Bronze Medalist have a strong history of coming out as the chupa-rustam. India’s Chances: Before we move on, let’s make it clear that this 18 men squad in blue isn’t our dream team, led by a coach who has an invisible sword hanging on his head. But we must be hopeful here and not forget key events of history, such as the 1983 Cricket World Cup. After all, what’s a sport without hope? Injuries to seasoned striking forwards SV Sunil and Ramandeep Singh, the unexpected exclusion of sole drag flicker Rupinderpal Singh, and the retirement of arguably the strongest midfielder in the world, Sardara Singh, though has shaken the experience quotient in the team. Yet, this has also paved the way for a much-awaited chance to the Junior World Cup winners like Hardik Singh, Simarnjeet, Nilkanth Sharma and local boy Amit Rohidas. This is India’s youngest ever team participating in the World Cup. For India, the team’s performance is structured bottoms-up with dependable Sreejesh at the Goalpost, Manpreet in the center and Akashdeep at the top. Under Harendra Singh, India has come back to playing attacking hockey. There are stark differences between the Indian Subcontinent-style of hockey with its flair and skills on one side versus the European style of short passes and moves on the other. Our team has finally learnt to make the best of both worlds by being able to leverage the desi skills of dribbling in close 1:1s but is also able to create moves and rotate between flanks using small passes. The team has also come a long way when it comes to fighting back from being a goal down and statistics of overall ball possession are positive in its favor as well. On their day, when everything clicks, India has the potential to beat any opponent. India's coach Harendra Singh has also impressed. His leadership, mental composure and belief to stick to the game plan and ability to quickly adapt to the opponent's style have all impressed. The role assigned by him for Akashdeep Singh is to play as a withdrawn forward – a role played in the past by legends such as Dhanraj Pillai and Mohammad Shahid in the later stages of their careers. This is a strong mitigation strategy which adds to our safety net against much faster and dynamic opponents. India’s major concern areas are conversion of penalty corners as the team lacks not just a strong-arm drag flicker but is also heavily limited on its capability to pull through tactical variations, and the sustainability during the dying moment’s pressure. If these two major areas are not much exposed in our gameplay through the tournament, the waves of optimism which have been routinely drowned in the last 43 years can finally be replaced by a true sense of realism. The writer is a self made entrepreneur coming from extremely humble beginnings. His areas of passion involve sports in general with Hockey in particular coupled with contemporary study and modern day relevance of Ramayan. Fighting a severe disease for years, these passions have served as his steroids and hockey is his adrenaline rush. For Hockey, he dreams big and is working to see his city develop as an important hub with a glimmering astro turf facility.